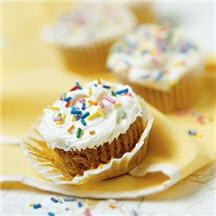 Fix these cupcakes in a jiffy using spice cake mix, canned pumpkin and a prepared cream cheese frosting. Kids will love this sweet, spiced finger-food and clean-up will be a breeze. Preheat oven to 350°F (175°C). Paper-line or grease 24 muffin cups. Blend cake mix, pumpkin, eggs, vegetable oil and water in large mixer bowl until moistened. Beat on medium speed for 2 minutes. Pour batter into prepared muffin cups, filling 3/4 full.